The Internet has played a crucial role in introducing menswear aficionados to the visual nuances that permeate tailoring traditions – whether they come from the good old UK or the sunny shores of Naples, and the Neapolitan jacket has undeniably grown in popularity for men who shop and appreciate classic menswear. The following is a guide to Neapolitan jacket characteristics – what differentiates them, and what makes them worth owning. Neapolitan jackets offer comfort and lightness, and they are, de facto, the leisurewear of tailoring. If properly constructed and tailored, you should be able to perform any daily task while wearing a Neapolitan jacket – from riding a bicycle to harvesting tomatoes (tasks that you will witness with your own eyes if you take a walk in the southern Italian countryside). As dress codes at workplaces become less and less rigid, following the 21st century tendency of upgrading leisure and casual clothing to “everyday” clothes, Neapolitan tailoring has found a niche in the market of people that appreciate fine tailoring but won’t give up comfort and a bit of edge in their style. This is my humble contribution to explain to the many, English-speaking fans of Neapolitan tailoring the beauty behind her majesty the Neapolitan Jacket, so grab your glass of Aglianico now, and keep reading. Traditionally, the Neapolitan jacket has no shoulder padding. While it certainly helps make the figure appear broader in the upper part, shoulder padding restricts movement, and if you are a Neapolitan gentleman who is used to gesticulating a lot, that is definitely a deal breaker. On account of these considerations, Neapolitan tailors removed the shoulder padding from their jackets altogether. In order to facilitate freedom of movement, the Neapolitan shoulder on informal jackets is sewn like a shirt sleeve (“spalla a camicia”) and it follows the natural curve of the human body rather than give it shape. This type of sleeve is cut about 10 cm larger than the armhole, and it can be finished with the “repecchia” – that visually interesting shirring the tailor creates with the extra fabric. This little flair, which supposedly allows for even more freedom of movement, is known as “manica a mappina”, and it gives the jacket a beautiful “rugged” appearance (“mappina” is a Neapolitan word for rag). For formal occasions, the Neapolitan shoulder features a “rollino” – a little roll of padding that raises the sleevehead to drape more cleanly. The Neapolitan sleeve is usually shorter than that found on other jackets, as Neapolitans love their shirt cuffs to peek right above their wrists, especially when adorned with elegant cufflinks. The sleeves are cut closer to the arms, in order to avoid extra fabric hanging when these are raised (again, you’ve got to admire that talent for speaking with their hands). In line with the sinuous shape and lines of the Neapolitan tailoring, the pockets of a Neapolitan jackets are usually curved and applied as patches; the breast pocket is called “a barchetta”, which literally means “little boat”, due to the higher top corner of the pocket, which, along with the rounded bottom, gives it the shape of a stylized boat. The side pockets are equally curved, and their shape recalls that of a pot – hence the name “a pignata”. Neither of these features have any practical functionality, but they are particular to Neapolitan tailoring and they contribute to the sophisticated yet relaxed look of a jacket made in Naples. As an ultimate touch of elegance, double hand finished stitching runs throughout the sides of the patch pockets – a recurring feature in informal Neapolitan tailoring. Just like shoulder padding, lining is considered an unnecessary burden and the Neapolitan tailors keep it as minimal as possible. Usually, the jacket is unlined or only half lined, in order to provide lightness; even the sleeves are completely unlined, as they’re meant to fit like a second skin. Additionally, the lining is often left open (“volante,” literally “flying”) so that we can admire the fine details and construction of the jacket. Neapolitan jackets are famous for their wide lapels, which oftentimes are peaked (“a punta”) for double-breasted jackets, formal jackets, and coats. The “risvolto dentellato” (the “classic” style of lapels – not peaked) are notoriously wider in Neapolitan jackets: they can be as wide as 4 inches, compared to the 3 inches of a regular lapel width). Just as is the case for the pockets, the Neapolitan lapel features double stitching running along the sides – a stunning detail that’s peculiar of a Neapolitan creation – although reserved for the less formal pieces. The “scollo a martiello” (literally “hammer neck”) is the opening of the jacket over the shirt, which in Neapolitan tailoring is perfectly parallel to the lapels. The cran (but you can call it sgarzillo if you want to give your tailor a good laugh) is the space that separates the lapel and the neck, and it is usually higher in Neapolitan tailoring to create the illusion of a more slender figure. You might have noticed that Neapolitan jackets tend to be shorter in the back; in Neapolitan dialect, they say the jacket “zompa arrèto,” which roughly translate as “it jumps in the back”. This characteristic allows for the jacket to “slide” gracefully along the body. The vents on the sides are notoriously quite deep in Neapolitan jackets – up to 12 inches. The darts (“pences” or “riprese”) in the front go all the way down, to help the fabric follow the shape of the body and create elegant quarters. Perhaps the most infamous characteristic of the Neapolitan jacket is the three-roll-two construction (“tre bottoni stirato a due”); the Italian translation makes it clear that the lapel that hides the third button is actually ironed by the tailor, who gives it a roll that elegantly folds over the button. The reason of this choice is – you might have guessed it – the extra freedom of movement provided by a longer opening in the front. The buttonhole on the lapel is called “occhiello” in Italian, and it means “little eye” for its elongated almond shape. There isn’t really a tradition for a specific type of buttonhole in Naples, but we should note a tendency of Neapolitan tailors to prefer slightly shorter and thicker buttonholes that resemble those of a shirt, while “regular” buttonholes of English tradition are more elongated and slender. Some tailors add a little teardrop shape at the end of the buttonhole, but that’s an aesthetic choice that does not refer to a particular tradition. For what concerns the buttons on the sleeves, they are always working buttons, and they are always overlapping, as if they were kissing each other. If you ever find yourself strolling by the street of Naples, please do consider investing in a bespoke piece from a Neapolitan tailor. They represent a milestone of cultural heritage and tradition, and we owe them a great deal in terms of style and lifestyle. Additionally, having a suit made by a Neapolitan tailor is an experience that goes beyond the mere object that’s handed to you at the end of the process; it is a ritual. And, like every ritual, it involves libations, which in Naples can’t be anything other than caffè. When you’ll walk in the tailor’s atelier, you’ll be welcomed by a tiny cup of black, scorching coffee, and delicious Neapolitan pastries. Don’t be surprised when you’ll see the workers take just one sip of coffee as you drink all of yours: they greet every customer with a cup of espresso, and while they won’t let any of them enjoy it solitarily, they simply can’t handle that much caffeine in a single day. L’eleganza dello Stile – Duecent’anni di vestir maschile – Vittoria de Buzzacarini, ed. Lupetti. Note di Stile – Sergio Cairati, 2016, sold by Amazon digital services. The jacket used as a model is by Sartoria Formosa for No Man Walks Alone and can be purchased here. 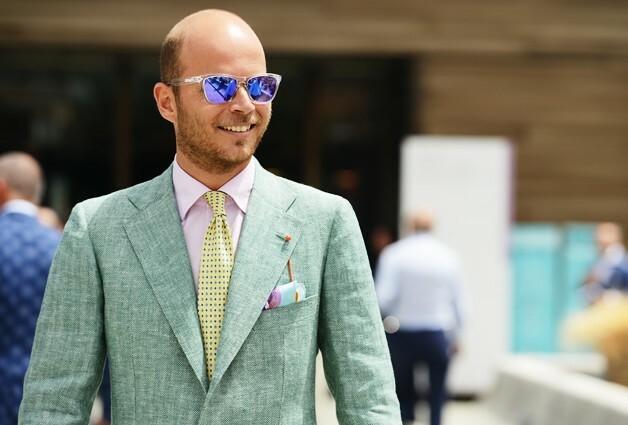 This entry was posted in Style, The Tailors' Thread and tagged barchetta pocket, neapolitan jacket, neapolitan tailoring, rollino, sartoria formosa, spalla a camicia, three roll two by Arianna Reggio. Bookmark the permalink. Great piece. I saw an article one comparing the Neopolitan jacket to the Ivy Style jacket. Many similarities between the two, though I usually see Neopolitans cut just a little slimmer. Thank you! Yes, from what I can see Neapolitan jackets are cut slimmer, especially in the sleeves since they have to “hug” the arms. Nevertheless, there are many similarities between the two! Thanks for this excellent article Arianna, I learnt a lot from it. Glad you enjoyed the article! Thanks for stopping by. Molto Interessante. Can you please better explain the “scollo a martiello” feature ? We have a “scollo a martiello” when the opening of the jacket over the shirt has the same shape and width of the lapels – you can see an example in this picture.